The Thanksgiving and Christmas holidays will be here soon and I am looking forward to making this Spinach Dip, which is a tradition on our hor d’oeuvres buffet. I usually make several appetizers to welcome my guests at my holiday feasts, but I must have this dip. For me. I know you can buy spinach dip year round in just about every market, in plastic containers and from bowls in the deli case. But none of them have the punchy taste I crave in my dip. In fact you may want to start with 1 ½ tablespoons of the Buttermilk Dressing Mix, ascertain your personal seasoning level, then add more to taste. If you like bold flavors the way I do, jump right in with the full recipe amount. This year I think I’m going to put my Spinach dip in a bread bowl. I’m going to get a La Brea Bakery small country white loaf, cut off the top, pull out the soft inside and fill it right up. Whoa, looks like there is a panzanella salad coming up in my future to use up the extra bread. That is a happy thought. Cheers. 1. Combine all ingredients in a medium bowl. Separate the clumps of spinach so it is evenly distributed. Chill. 2. Serve with raw veggies, Wheat Thins or sliced baguette. I trust you! I don’t know if there are many party foods that I like better than spinach dip in a sourdough bread bowl. Just thinking about it makes me want to start baking! 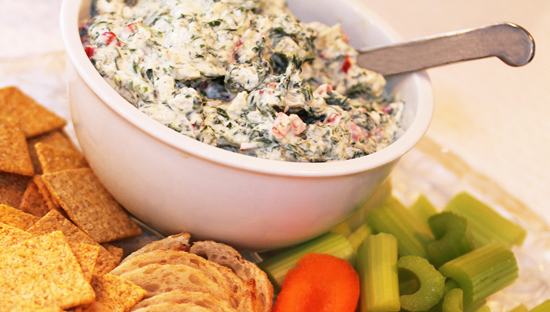 Thanks for sharing a great dip to serve at parties with friends. That looks like my kind of dip! I never thought of adding water chestnuts. How intriguing. Will be making this one soon! I love the idea of putting this dip in a bread bowl. But then I fully intend on keeping the bowl with all of it’s seeped in dip all to myself. Just saying. Will you believe me if I tell you I have never tasted spinach dip? It sounds like yours will be a fantastic first try. Beautiful, easy and delicious – what could be better??? I served a spinach dip last year too – my cousin is allergic to aged cheese so my “cheesey” options are a bit limited – mine was similar but had bacon in it… but I will definitely have to give this one a go!! OMG! I love spinach dip but have never made it at home. I have friends that make it so I just go over to their house! ha! Thanks for this super simple recipe. I’m a big fan of water chestnuts and love the fact that you added them. Yum! The mayo lurs me in every time. This looks good! I just made some spinach dip myself and I LOVE it! This is absolutely yummy. Had all these ingredients on hand, easy to make. Watching football and enjoying your recipe! Thanks!